We know why the dinosaurs disappeared! We know why the dinosaurs disappeared! 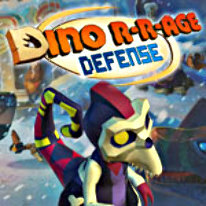 Fight off hordes of dinosaurs! Build defensive towers and survive in the Ice Age! Wage an uncompromising war of the species in an alternative history in this continuation of a popular strategy game. The scientist and his electronic assistant are in trouble again. Defend the time machine with the power of science and strategy. Use powerful inventions to defeat hordes of new vicious enemies. Enjoy 2 new episodes with a multitude of levels, complete with comics to tell you all about the heroes' adventures, their search for fuel for the time machine, and the nuances of life in a predatory era. -The technologies of the future against fossilized species! -Fearsome weapons and unique opponents! -Excellent game balance! Show your dominance!